Globacom Nigeria has reviewed it’s internet data and price and here are the latest and best Glo internet data plan for all devices – PC, Android phones, iOS. As the Nigeria telecommunication space get’s more competitive and as new devices are released, so also new internet data plans are evolving daily. Glo network is the easiest way to access the internet these days. For those who are too busy within the week and those who keeps late nights, GLO has the perfect package for you. Others who prefer free browsing, you can use Glo Your- Freedom cheat, or Glo Psiphon Tweak, the Glo UC browser cheat or Glo Tweakware VPN Tweak. Getting the latest Glo Internet data plan for your devices is very important and so it is better to stay updated on what tariff plan is available. Today, I will be briefing you guys on the best and affordable Glo internet data plan which hopefully, will keep you online in the upcoming ember months. 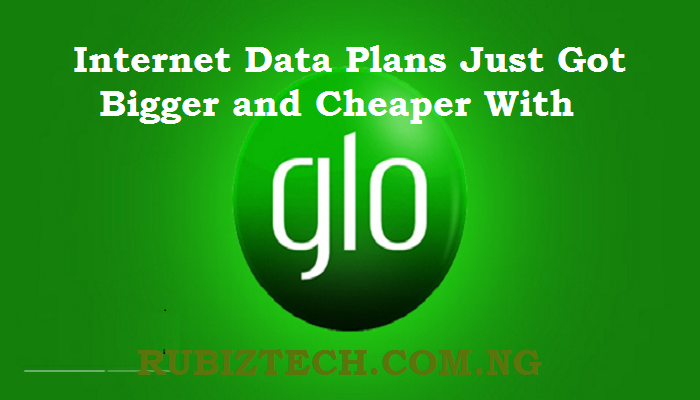 Below is a list of internet data plans been offered by Glo Nigeria and how to subscribe. Dial *777#, select monthly data and choose the plan of your choice. It is true that Blackberry devices are officially fading away, luckily the popular Glo BIS for Android is still working. However, the 3GB Glo BIS Complete plan has been scaled up from N1,000 to N1,400 and of course, this is only available to those who have tweaked their Android IMEI. However, comparing the price with the reviewed data plans above, this is no longer in vogue. Albeit, last time I tried their 3GB of N1,400 recently but was disappointed with the way they are deducting megabytes and the network speed is now very poor though the 3GB of N1,500 plan doesn’t zap the data. So, if you must run Glo BIS on Android, I will advise you go for the N1,500 for 3GB. They also offer other BIS tariff plans like 2GB for 1k. To subscribe for any of these plans, see details here. The process involves combining Glo BIS Complete monthly plan of N1,400 with Glo Flexi-Data Plan – a weekend plan of N500 both for 3GB respectively. When you combine both, you will have 6GB for N1,900. See details here. Weekend Plan: N500 for 3GB, for Saturday and Sunday +7Nights from 12am to 5am. Simply dial *777# and follow the prompt [Data Services » Buy Data » Night and Weekend plans], then select1 for Night plan or 2 for the weekend plan. This is another bonus offer from Glo Nigeria. I received the SMS from Glo network a few days back offering me TALK SPECIAL for N4,000 Talk Time, 500MB data and 250MB data as a gift for just N1,000 for browsing, Texting, data gifting and to call all networks. For how to enjoy the Talk Special plan, click here. Here you go! All Glo customers are eligible for the above offers. Is there any other Glo internet data plan you know of that is not listed? Kindly let us know by using the comment box below.